PolitiFact Bias: Different Strokes for Different Quotes: What does "voted for tax cuts" really mean? Different Strokes for Different Quotes: What does "voted for tax cuts" really mean? "What I find is it's hard for me to take critics seriously when they never say we do anything right. Sometimes we can do things right, and you'll never see it on that site." Sometimes PolitiFact can do things right. PolitiFact added the Trump camp "did not get back to us with information supporting his claim, so we can't say for sure what he was talking about in his endorsement." PolitiFact noted that Trump tweeted about the Tax Cuts and Jobs Act "four other times in May" but acknowledged Trump did not reference that law in the tweet it fact checked. In our view this is the correct approach. We think a persuasive argument could be made that Trump inaccurately implied Donovan was a Tax Cut and Jobs Act supporter, but that argument belongs on the editorial page, not in a fact check. PolitiFact examined the claim Trump made without inventing assumptions about what he meant or what he was implying. In this case PolitiFact stuck to the facts. Notwithstanding our longtime opposition to rating facts on a sliding scale, we think PolitiFact did this one right and we're happy to point it out. Readers may wonder "How could a fact checker screw this one up?" Donovan had a documented history of voting for tax cuts, and Trump's claim was not only unambiguous but also easy to check. How could a serious fact checker get this wrong? When the Washington Post's unabashed Trump basher/unbiased truthsayer tweeted that "fact checkers sometimes disagree" we were curious. 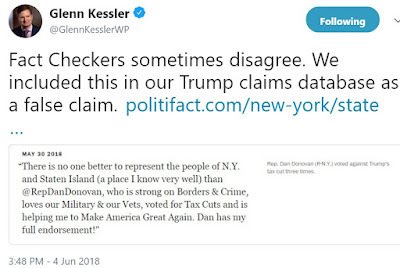 PolitiFact rated Trump's tweet as accurate, while Kessler deemed the exact same tweet false. How can that be? As it turns out the two fact checkers aren't disagreeing at all. PolitiFact correctly identified the claim Trump made and ruled based on his actual words. Kessler invented a claim and then gave Trump a false rating for his own fantasy. The fact checkers aren't disagreeing because they're not checking the same claim. 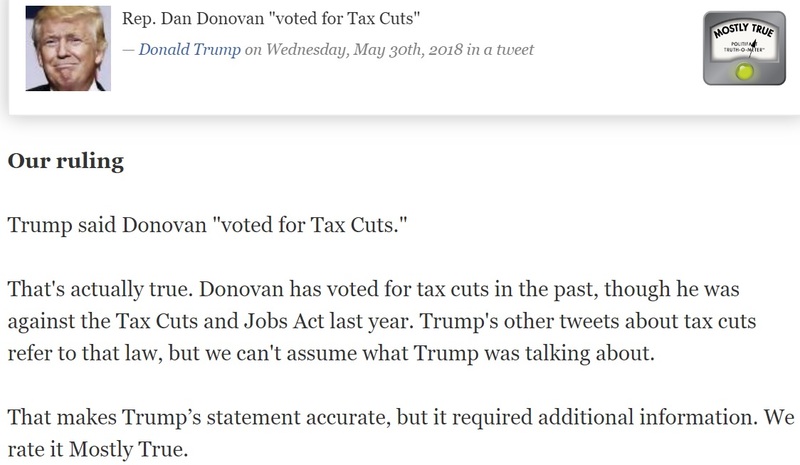 Kessler says Trump's claim that Donovan "voted for tax cuts" is false because "Donovan voted against Trump's tax cut three times." 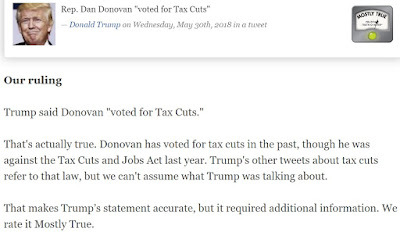 For those of you that aren't experts in journalism or logic, voting against the Tax Cut and Jobs Act does not negate the fact that Donovan has previously voted for other tax cuts. 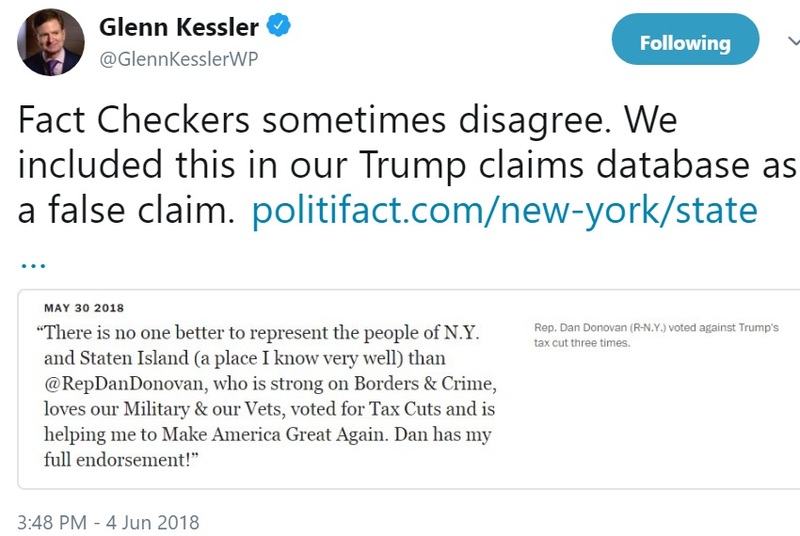 As far as we can tell, Kessler offered no justification for calling Trump's claim false other than Donovan's opposition to the 2017 tax bill. Kessler's reasoning here is flatly wrong. And if one wanted to treat Kessler with the same painful pedantry as he applies to Trump in his chart, one could note there's no such thing as "Trump's tax cuts" because only Congress can pass tax bills. Petty word games aside, this "disagreement" among fact checkers affirms that our fact-divining betters are neither scientific agents of truth nor objective determiners of evidence. When a fact checker can substitute a person's actual words for their own interpretation of what that person meant it counts as commentary, not an adjudication of facts. Kudos to PolitiFact New York for taking the correct approach. Sometimes PolitiFact can do things right. PolitiFact Wisconsin: The Future is Now!